Dollhouses, the primer. 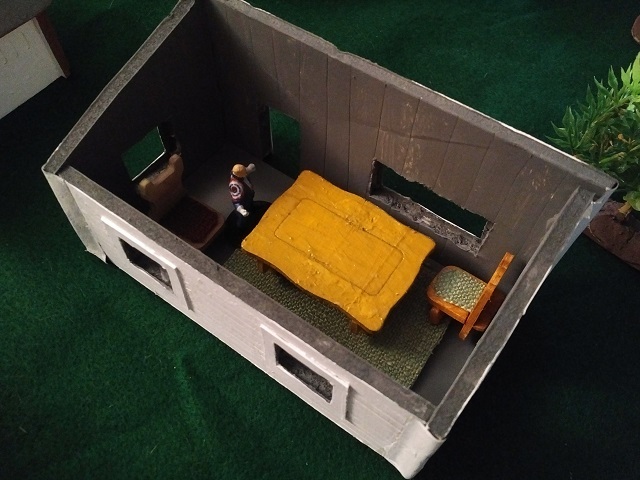 The "standard" dollhouse is 1:12 scale, leading to a six inch tall doll representing a "standard" six foot human. Awesome. Quarterscale is, through the magic of complex maths, 1:48. It is also uncommon, but you can still find it most of the time where dollhouse stuff is. 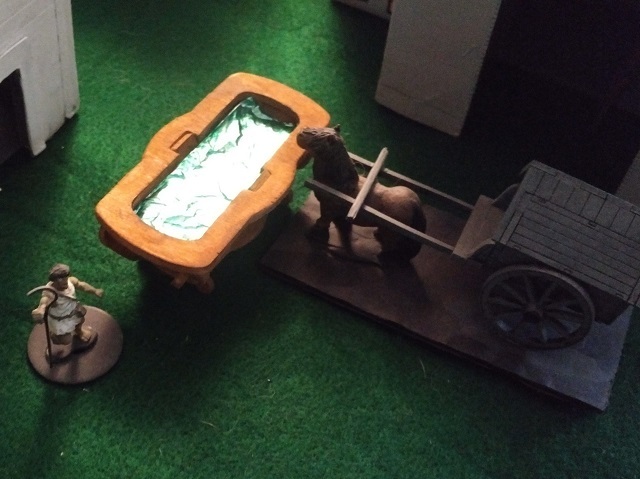 It is also really close, but not right for 28mm figures. 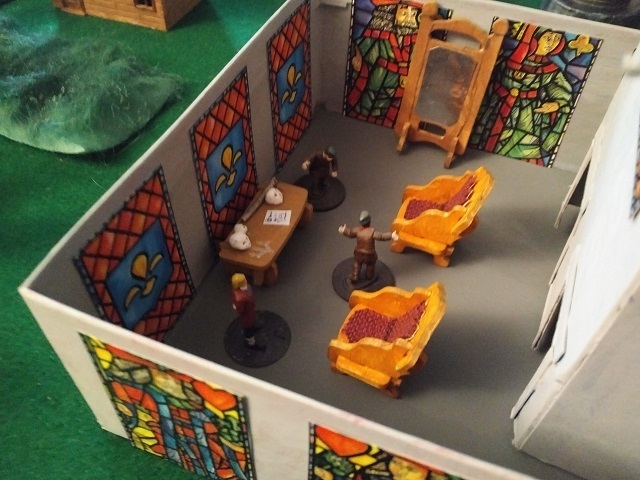 Fortunately, the dollhouse people have the some of the same challenges that wargamers do with scale/size/dammmitthisdoesn'tlookright. 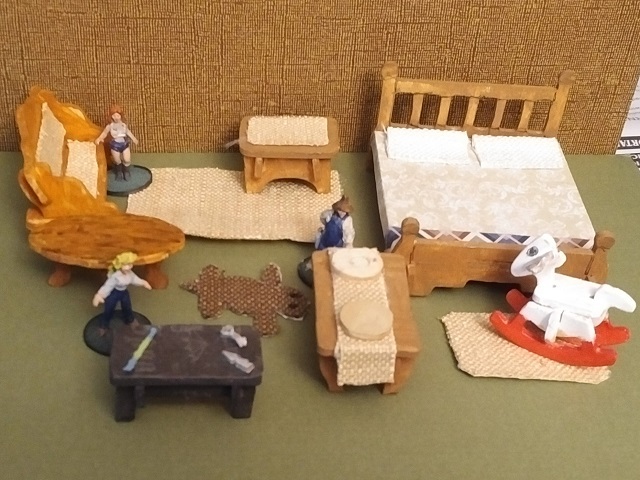 The above pic is a set of nominally 1:48 dollhouse furniture/puzzle toys. Pretty cheap, too for all the stuff you get. So I gave it a whirl. Besides the plain wood, which is fine for some furniture, I wanted to add some upholstery. 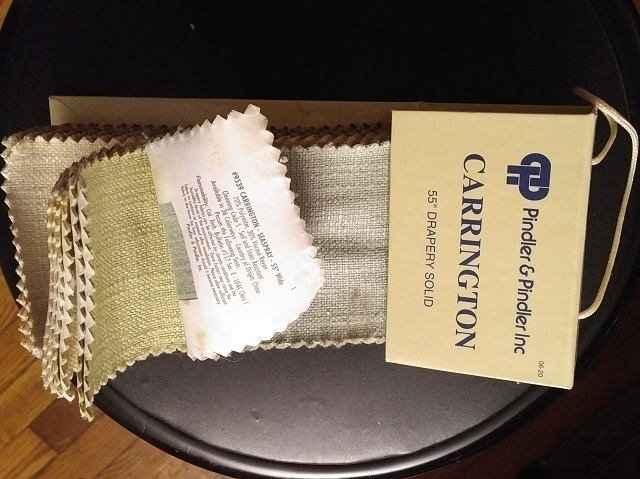 This is an old set of sample swatches for some furniture or rug or curtain place. 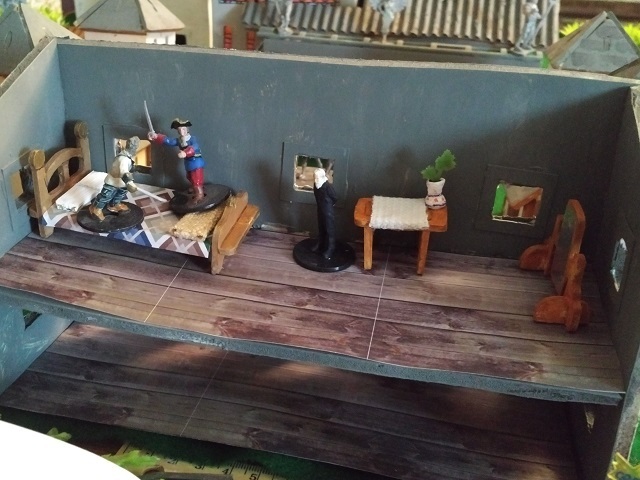 Nice bits of common fabric, textures, and colours for adding to plain wargaming terrain. And this is the "bathtub", which is waaaaaay too big. For a tub. But if you fit a piece of paper in it and add foil, paint, and gloss sealant ... well ... we will see later. But first, chairs, a table and a mirror. The chairs got some red fabric for the seat and back. The table got some odds and ends - a bit of paper with some scratchings on it and a couple of skulls made from leftover sculpting clay. And the mirror got a slice of tin foil added. It actually reflects. The chairs look like big, comfy chairs. The rest are all OK. Everything (pretty much) got the nippers taken to the legs to make them shorter. 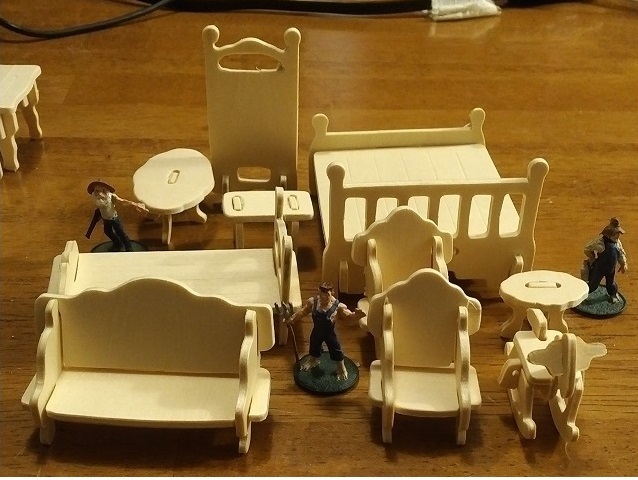 Unlike real furniture I have made, none of these ended up with odd legs that needed shaving and shims. The bed is supposed to be a twin, but it is large enough for a double. A little too big, but that makes it perfect for two 28mm dudes to have a swordfight on and off of it. And when it is upset, it will make a nice believable bit of cover. The table got a little runner and a spare clay vase. I also end up with bits of foilage that I collect in a small cup for just such occasions. The mirror was taken off the top of the vanity. 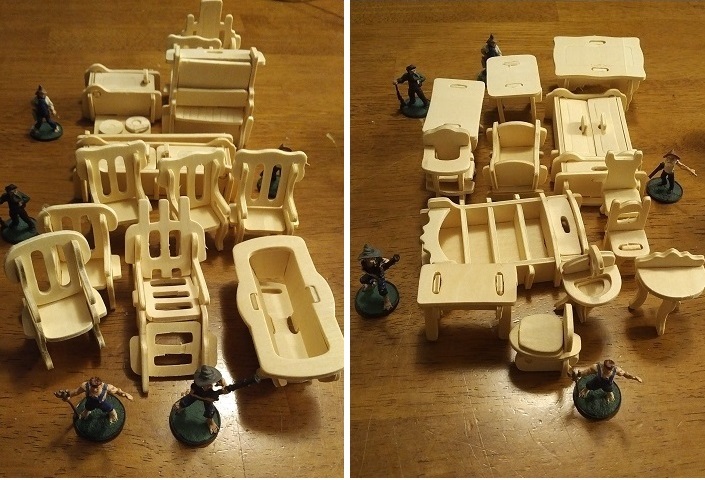 Again, too big, but when pieced out, it makes a reasonable bit of 28mm furniture. These chairs look fine (after shortening), not big at all. The table domiates this buliding, but it looks great. 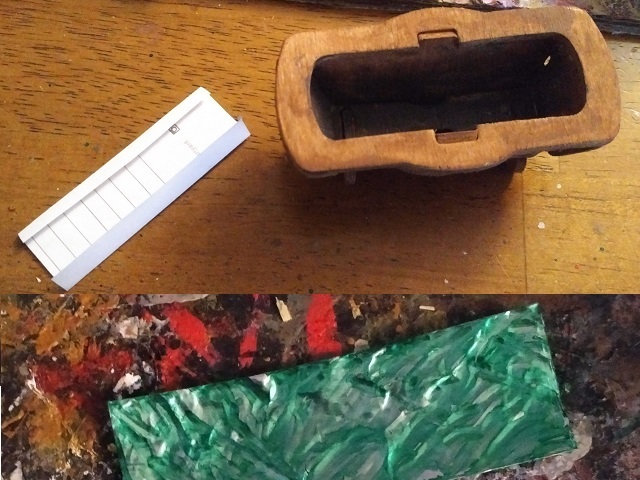 I used some ink in strips then paint and texture with sealant to get a good wood look (that hides the connection bits on the top). And a big collection. The big bed is really big. It looks like it could fit several hillbillies on it. Also probably good for an oversized royalty bed. Also ... rugs! The swatches make nice rugs and carpets. And, finally, here's the tub. I mean horse trough. I mean why isn't the horse unhitched from the wagon. I mean it's a good use for that bit. There were several bits, notably the shelves, that I didn't use. I will probably leverage those for my next scifi interiors project. Still, overall, what I got out looks nice and was inexpensive not counting the (yet) unused bits.